In diesem exquisiten Bundle präsentieren wir Ihnen diesen Boliden in der Version eines Dirty Hero auf einer hoch-wertigen und massiven Grundplatte, staubsicher abgedeckt mit einer Acrylglas Abdeckung. These are by far our best displays, produced by CMC this will proudly display your favorite 1:18 or 1:24 models. For more than a quarter century, Replicarz has been family owned and operated. Not intended for children under 14 years of age. Es sieht genauso aus wie auf dem Bild. In blue color. By an artist with more than 30 years experience. ( awailable 3 weeks after your order ). Es sieht genauso aus wie auf dem Bild. Barney Oldfield. Karl Benz Figur für 1:18 CMC Mercedes Patent Motorwagen VERY RARE! Es sieht genauso aus wie auf dem Bild. In graue Anzug. Nino Farina Figur für 1:18 CMC Ferrari 500 F2 D50 VERY RARE! Nino Farina. Es sieht genauso aus wie auf dem Bild. Alberto Ascari. Es sieht genauso aus wie auf dem Bild. Manfred Von Brauchitsch. Es sieht genauso aus wie auf dem Bild. Stirling Moss & Denis Jenkinson. 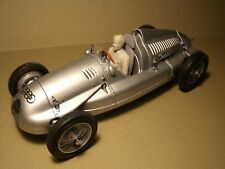 Tazio Nuvolari Figur für 1:18 CMC Alfa Romeo 8C 2300 2600 RAR ! Tazio Nuvolari. Es sieht genauso aus wie auf dem Bild. Juan Manuel Fangio. Es sieht genauso aus wie auf dem Bild. Rudolf Caracciola. Es sieht genauso aus wie auf dem Bild. Ettore Bugatti Figur für 1:18 CMC T35 TYP35 VERY RARE! Ettore Bugatti. Es sieht genauso aus wie auf dem Bild. Gottlieb Daimler Figur für 1:18 CMC Mercedes Motorkutsche VERY RARE! Es sieht genauso aus wie auf dem Bild. Gottlieb Daimler. Juan Manuel Fangio. Il ressemble à l'image. Es sieht genauso aus wie auf dem Bild. Hermann Lang. The case is specifically designed for all of the CMC 1:18 scale trucks and transporters, as well as any of their 1:12 scale models. Solid wood base with felt covered bottom. Very high quality crystal clear acrylic dust cover. Specially made for CMC MASERATI 250 F. the painting is made by an artist with more than 40 years. CMC Display Case. Manufacturer : CMC. Scale : 1/18 1/24 CMC MODELS. Suitable for : 1:18th and 1:24th scale models. 88gsm Brown Paper is used, this is the industrial type. Your item will always be well presented - I.E it will look the way that parcel should look. 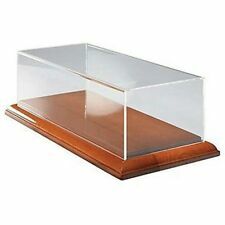 Top of the range display case with real wood base and extra-thick acrylic cover. Suitable for most 1:18 cars up to 27 cm long. It is made by CMC and is 1:18 scale (approx. 30cm / 11.8in long). Enzo Ferrari Figure for 1:18 CMC 250 125 F2 VERY RARE! Enzo Ferrari (2) Figure for 1:18 CMC Ferrari 250 GTO GT VERY RARE! 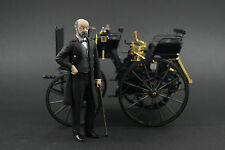 Gottlieb Daimler Figure for 1:18 CMC Mercedes Motorkutsche VERY RARE! Ferdinand Porsche Figure for 1:18 CMC 901 VERY RARE! Sergio Pininfarina Figure for 1:18 Ferrari CMC VERY RARE! Ettore Bugatti Figure for 1:18 CMC 57SC Corsica T35 VERY RARE! 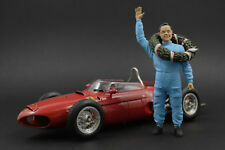 Nino Farina Figure for 1:18 CMC Ferrari 500 F2 D50 VERY RARE! Karl Benz Figure for 1:18 CMC Mercedes Patent Motorwagen VERY RARE! 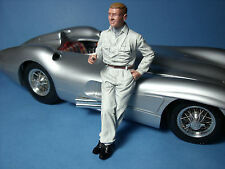 Tazio Nuvolari Figure for 1:18 CMC Auto Union TYP D RAR !